Summary: Following a bloody battle against foes on every side, Paige Mahoney has risen to the dangerous position of Underqueen, ruling over London's criminal population. The wait for the third book in my favourite on-going series has been torture, but in the end it was worth it. 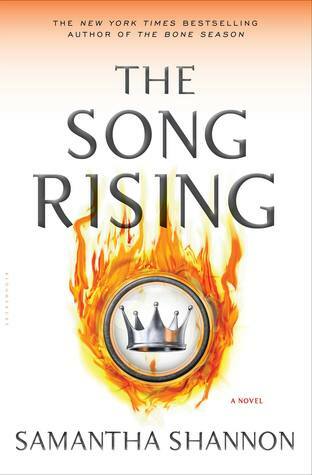 The Song Rising met my expectations, with its killer twists and shocking revelations. It was my first (and only) five star book of 2016 and I wasn't even surprised! As someone who is bored of typical dystopian fiction, this series is a breath of fresh air. The way it mixes urban fantasy with dystopia just works. Utterly compelling, it's like no other dystopian series I've read before. The Song Rising picks up where the previous book left off. Paige is trying to bring together the underworld, which is no easy job. She wants change and with change comes hard decisions. Some decisions she comes to regret as they back fire, and this sometimes makes her doubt herself and her ability to be Underqueen. At the end of the day, though, she knows she has to shoulder the responsibility and learn from her mistakes. Her continued growth amazed me, and I'm sure there's more to come as the series progresses. Some may find the pacing of the first half of the book slow as there's not a ton of action. As with the previous book, however, I didn't mind the pacing. I found every page of The Song Rising to be fascinating. The world-building expanded in this instalment of The Bone Season series, and it added even more layers to the story. We finally see Paige stepping out of Scion London, and exploring Scion Edinburgh and Manchester. I found the snow filled journey and exploration into both places interesting as they differed quite a bit from Scion London. In regards to Warden and Paige, whenever these two were in a scene together there was this palpable chemistry, it didn't matter whether they were talking, not talking, or making out. They just have this amazing slow burn romance. I can say hands down that they are my top ship at the moment. They work so well together, and even when problems arise in their relationship I like that Warden doesn't push Paige. He fully supports her and knows when to step back. I loved the winter atmosphere in The Song Rising, and it was exciting to see the sparks of revolution being set into motion. The last half of the book especially was full of surprises, and with the way things ended I'm looking forward to seeing what happens next! Oh, I'm so glad to hear this book was worth the wait! I can't wait it for it to be released, though it's been so long since the last book, I might have to read a recap before I start it. Very excited to jump back into the world though - thanks so much for the review! AHHH, I am so glad this didn't disappoint! I loved the first book and thought the second was just alright, but I really want to continue with the series so I'm glad this is a stellar installment. I can't wait!! Eeeep, I can't wait to read this one! I'm so happy it met your expectations! The wait is forever! I can't wait for this one. :) I am so glad it didn't disappoint.